WARNING: When looking at any solar eclipse, NEVER look directly at the sun whenever ANY PART, no matter how small, is visible. It is dangerous to look at a partially eclipsed Sun but take your glasses off if the Sun is completely covered by the Moon. Eclipse Day! Millions in the U.S. will have their eyes to the sky as they witness a total solar eclipse. The solar eclipse touches down in the north Pacific Ocean at 16:48:33 UT, at local sunrise. (At that spot, the Sun will actually rise while totally eclipsed). 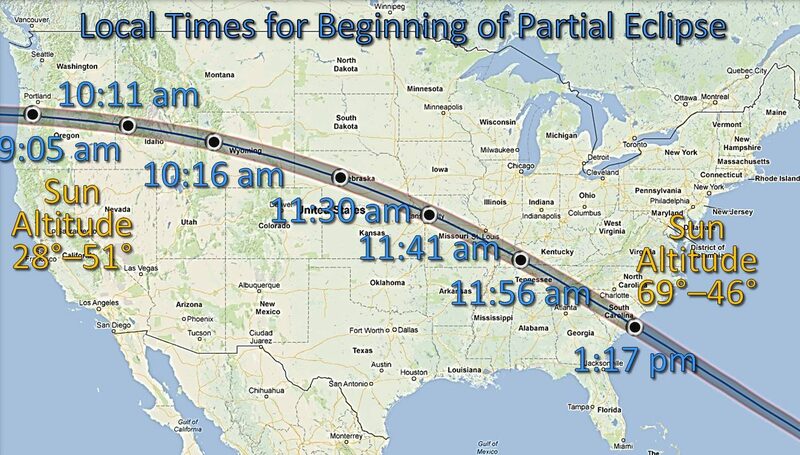 In U.S. the shadow first touches land in Oregon at 17:15:50 UT (at about 10:15 in the morning). Then it cuts straight trough Idaho, Montana, Wyoming, Nebraska, Kansas, Iowa, Missouri, Illinois, Kentucky, Tennessee, Georgia, North Carolina and ending in South Carolina. The eclipse will last around a minute and fifty seconds (varies based on your location). An annular eclipse occurs when the Sun and Moon are exactly in line, but the apparent size of the Moon is smaller than that of the Sun. Hence the Sun appears as a very bright ring surrounding the dark disk of the Moon. Thanks to elevation data of the moon from NASA’s Lunar Reconnaissance Orbiter, or LRO, coupled with detailed NASA topography data of Earth, we have the most accurate maps of the path of totality for any eclipse to date.